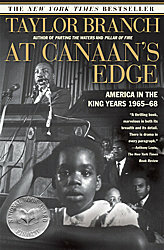 In At Canaan’s Edge, King and his movement stand at the zenith of America’s defining story, one decade into an epic struggle for the promises of democracy. Branch opens with the authorities’ violent suppression of a voting-rights march in Alabama on March 7, 1965. The quest to cross Selma’s Edmund Pettis Bridge engages the conscience of the world, strains the civil right coalition, and embroils King in negotiations with all three branches of the U.S. government.